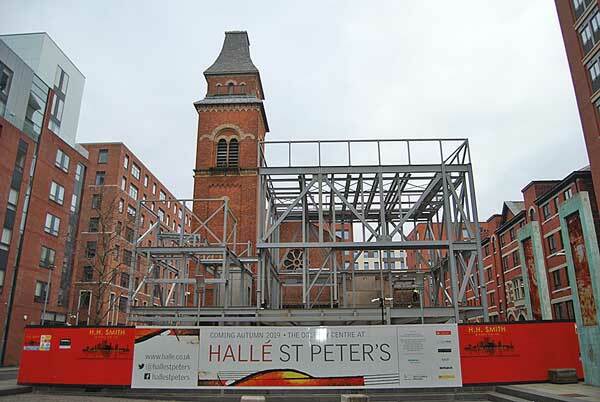 Manchester’s Hallé Orchestra is enlarging its St Peter’s rehearsal and recording facility with the construction of a steel-framed extension that includes acoustically-isolated practice spaces. Located in Ancoats, Manchester the three-level extension, to be known as the Oglesby Centre at Hallé St Peter’s, will provide a brand-new façade to the existing facilities, which are housed in a former church and front onto the adjacent open plaza of Cutting Room Square. Working on behalf of main contractor HH Smith, BD Structures has recently completed the steelwork erection programme. “The extension will provide additional rehearsal facilities, practice rooms, café function space and an exciting entrance atrium offering direct views up towards the existing church campanile tower,” explained Stephenson Studio Project Architect Stuart Hollings. The form of the extension is said to be expressed as a robust brickwork plinth at street level that cradles the first floor main rehearsal space. Most of the upper floor will be clad with weathering steel fins, allowing light to enter the rehearsal area while making an exterior reference to the industrial heritage of the local environment. The extension’s upper floor rehearsal room and two adjacent practice rooms are floating box-in-box spaces, which are acoustically-isolated from the primary structural frame and slab. This is to prevent sound transfer and ensure the highest level of acoustic performance in these key spaces. The boxes have their own compositely formed slabs, which are sat on acoustic pads and allow the spaces to be separated from the main first floor by a dividing and insulated void of 20mm.